Small U.S. Banks in a Big World? View the accompanying graphic here. The financial needs of individuals and companies around the world have grown exponentially in recent decades – explosive growth, far exceeding the rate of global economic growth.ﾠ And we’re not talking about derivative products, but debt and equity instruments expanding throughout the globe. Not only is this global market astonishingly large today, it’s only going to get much larger in coming decades. As we see economic growth in large emerging markets like China, India, Brazil and Nigeria, and hundreds of other smaller markets – in addition to continued growth in large developed markets – we’re going to continue to see a need for financial intermediation.ﾠ As the volume of trade expands across the globe, including exports by U.S. firms, the need for global banking will grow. It’s about the only sure thing as you can bet on today. The “small bank” advocates – otherwise smart and well-intentioned people – are apparently unable to conceptualize the sheer massive needs of global finance, and instead imagine a world where small, local banks can do this work. So just at the time when financial institutions with the global networks and scale are most needed, we see breathless new calls to cap the size of banks – in particular, U.S. banks.ﾠ Simon Johnson recently argued that global banks should “simplify along national lines.”ﾠ Dallas Federal Reserve President, Richard Fisher, and former Kansas City Fed President (and current FDIC commissioner), Thomas Hoenig, each call for breaking up banks.ﾠ There’s an almost nostalgic, “Lake Woebegone” quality to their policy guidance. What these calls ignore is the fact that these institutions provide services that are in high demand around the globe, not just the U.S.ﾠ In fact, it’s hard to see how the global economy could efficiently function absent big, global banks.ﾠ For the U.S, it would mean forfeiting our ability to compete in this rapidly growing global market. 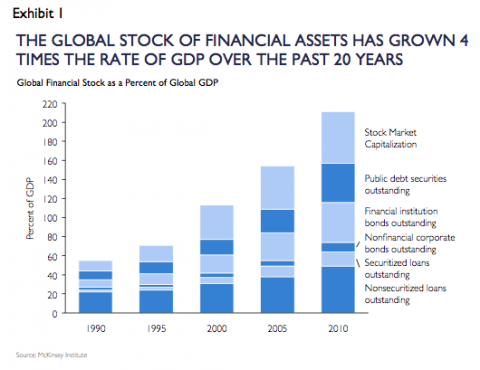 Here are the facts:ﾠ Since 1990, the global stock of financial assets has grown four times the rate of the global economy.ﾠ In nominal terms, this translates to over a 1000 percent increase (Exhibit 1). This does not reflect the growth of complex derivative products – only the value and volume of portfolio investments, private and official credit instruments and new capital markets in Asia, Latin America and Africa. More broadly, the data underscores how economic growth is trending towards the deepening of financial markets throughout the globe. The data also highlight that the financial needs of the global economy have caused global economic activity to become increasingly more interconnected. Cross-border flows – including foreign direct investment, loans, equity and debt purchases – reached $10.7 trillion annually before the financial crisis, up from less than $1 trillion in 1990. 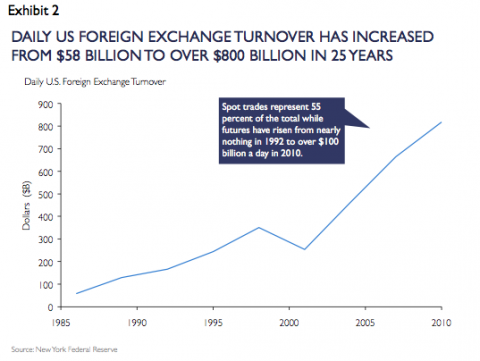 Beyond investment, U.S. trade volume has increased roughly four times its 1992 level. This level of economic activity is supported by a $10 trillion trade finance market and global foreign exchange activity that tops $4 trillion dollars a day, of which over $800 billion involves the U.S. dollar. That is more than a ten-fold increase since 1986 (Exhibit 2). The answer is, “No”. ﾠ Regional banks simply lack the scale and reach to serve a global market. A growing, complex global economy requires global banks. Excellent small banks and America’s regional banks are not equipped to handle financial transactions on this scale and in all corners of the globe. Instead of breaking up banks, let’s instead regulate banks in a way that improves safety and soundness by focusing on capital levels (and quality of capital), liquidity and transparency.